Shirts With Random Triangles: Georgia lands 2015 commitment from Miami, Fl. high school cornerback prospect Deandre Baker. Baker is a composite three-star CB according to 247Sports.com. 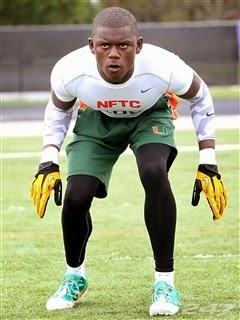 He comes in on the recruiting site's composite list of top cornerbacks in the U.S. at 76. Baker attends Miami Northwestern Senior High School in Miami, Fl. He stands 5'11", and weighs 175 pounds.